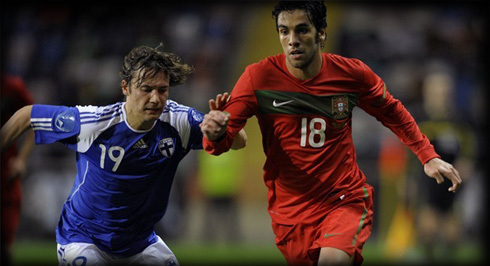 28.06.2011 » Sílvio: "I'm proud to play in the same league of Cristiano Ronaldo"
The Portuguese International, Sílvio, former SC Braga player who transfered recently to Atlético Madrid, is already anxious about his debut in the Spanish League. The Portuguese right-back had no problems in saying that he's very proud to be able to play in the same League of Cristiano Ronaldo, even though Atlético Madrid and Real Madrid share a big rivalry. Atlético Madrid's new signing Sílvio, was presented today and confessed to be very happy for the opportunity given to play in La Liga and said he'll do his best to help the club reaching their goals. Sílvio, a right-back defender, is very likely to have to defend Cristiano Ronaldo in a few matches throughout this season and confessed his admiration for CR7. While some players keep confessing their admiration and respect for Cristiano Ronaldo, others still prefer to throw some critics and point flaws to CR7. That's the case of Guti, former Real Madrid player and currently playing for Besiktas, that said this week that Cristiano Ronaldo was unable to show up in the important matches from last season. Guti: "Ronaldo is a great player, decisive in many matches. However, in the big games, he didn't make the difference we are expecting him to do. That's something that Lionel Messi for example has done. Star players are those who play a big role in the important matches." On an Editor note, Guti probably forgot that Real Madrid barely had the ball possession in the matches against Barcelona (30-40%) and even in such circumstances, Cristiano Ronaldo scored the winning goal in the Copa del Rey final. It's true that Ronaldo couldn't make the difference in the Champions League matches against Barcelona, but he's definately not the one to blame, since the whole team spent most of the game chasing Barça's midfield and their frustrating tiki-taka game style. Would be interesting to compare Cristiano Ronaldo and Lionel Messi in games where both teams can actually have the ball possession in more equal terms and then decide their ability to decide a match.